Jake Kensinger, my music partner of 26 years, passed away peacefully in his sleep on October 21st. This web site will be updated soon. "When I perform," says Schmidt, "I want to communicate with everyone in the room so they feel energized and uplifted. I want my songs to help people find the best in themselves." Something else that sets Ellen Schmidt apart from many other songwriters is her maturity. "My life experience seasons my songs," says Schmidt, who is in her early 70's. Shes taught school, cared for a dying parent, and raised seven children in a blended family with her husband of thirty years. Now a grandmother, she says, "I try to savor each day and enjoy the journey. My life is wonderful. I feel very thankful and I want to share this joy with my audience. I want to tell them: "Live your life joyfully. Enjoy the journey. Appreciate everything along the way." Schmidts songs are enriched by her gift for melody, unusual in the current singer-songwriter scene. "I always have melodies floating around in my head," she notes. Musically eclectic, she draws on classical music, folk, swing, blues, musical theater, and Latin American music; her fourCDs of original material, Soul of a Child, Gentle Hands, and You're My Baby, and Joyshowcase a variety of musical styles. Her songs are enhanced on CD and often in concert by the talents of outstanding instrumentalists such as Billy Novick on clarinet and saxophone, Seth Connelly on guitar and vocals, Steve Sadler on mandolin and dobro, Hatrack Gallagher on harmonica and Jackie Damskyon fiddle. Her daughter, Wendy Santis, and Jake Kensinger, her partner in the duo Two for the Show, often show up to add vocal harmonies. Schmidts gifts for words and music are a legacy from her mother, classical singer Norma Farber, who gave concerts of both lieder and contemporary art song; Schmidt remembers handing out programs, as a child, to one of her mothers recitals at Jordan Hall in Boston. Her mother was also a poet, some of whose words were set to music by composer Daniel Pinkham, as well as a writer of over twenty childrens books, including Schmidts favorite, How Does It Feel to Be Old? Schmidts father bequeathed her a different, but equally important legacy. Sidney Farber was the founder of The Dana-Farber Institute for Cancer Research. "As a child," recalls Schmidt, "I saw how my father was giving his life to important work, and I admired him tremendously." His example inspired Schmidt to a lifetime of combining music with community service. For years she has brought her songs into nursing homes and The Dana-Farber Cancer Institute, and has performed at countless benefit concerts. 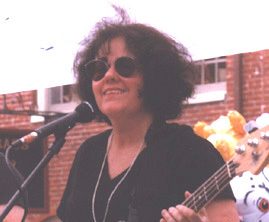 For twenty-five years she directed and performed in an annual benefit concert for The Huntingtons Disease Society, put on by the Folk Song Society of Greater Boston. She and her partner in Two for the Show perform every year at Bostons Walk for Hunger. And in 1999, honoring her father and his effect on her, she organized and performed in a concert to benefit the Dana-Farber Cancer Institute. In an era when most performers are committed only to their own careers, Schmidt stands out for her dedication to the marriage of music and community service. Beginning with her first benefit concert, she recalls, she learned how pleasurable it is to help other people. "What I want to do with my music", Schmidt says, "is to share the joy I have in life and in making music. And I want to let people who are struggling know theyre not alone, to help them heal to give them courage." Schmidt has brought her songs to coffeehouses, festivals, schools, nursing homes, and fund-raising events for over ten years. She has shared the stage with Les Sampou, Don White, and Billy Novick, and made frequent appearances on folk radio programs at WGBH, WUMB, and WERS. She also performs regularly with Jake Kensinger in the duo Two for the Show. Her prior album "You're My Baby" was released several years ago at the same time that her daughter, Wendy Santis released her first CD Besos Nocturnos. Wendy has had a life-long interest in music. She studied flute and piano as a child, performing in many folk music events with her family, learning many Latin-American songs as a Peace Corps volunteer in Ecuador, and through her years of work in public health with travel to Spanish-speaking countries and beyond. She has also sung with jazz bands and choral groups. Wendy writes her own songs and poems, sometimes collaborating with her mother. She sings Andean folk tunes, plays the quena (an Andean flute), and performs Latin American jazz standards in both Spanish and Portuguese. Wendy also does readings of her grandmothers poetry with background guitar by Steve Rapson. She celebrates many of these interests on her CD, Besos Nocturnos. Wendy is an engaging and joyful performer who delights audiences with her creamy vocals.